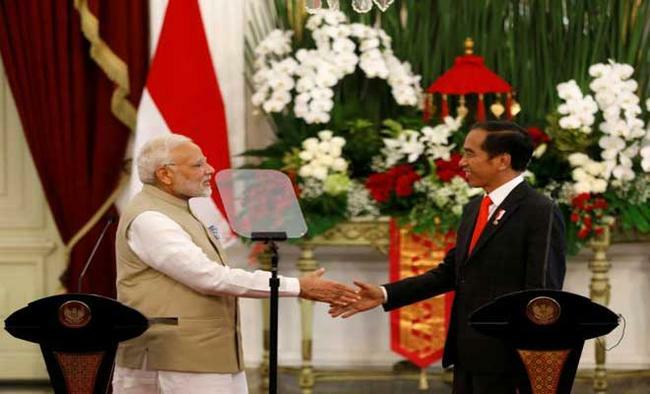 Jakarta: In a significant boost to their strategic ties, India and Indonesia signed an agreement on defence cooperation among 15 others following a bilateral summit between Indian Prime Minister Narendra Modi and Indonesian President Joko Widodo here on Wednesday. The agreement on defence cooperation calls for "regular bilateral dialogue and consultation on strategic defence and military issues of common interest, exchange of strategic information, military education, training and exercise, cooperation among the armed forces including army, navy, air force and aerospace, humanitarian aid, disaster relief, peace-keeping and medical services among others". The agreement assumes significance given the two countries' strategic interests in the Info-Pacific region.The two sides also signed a framework agreement on cooperation in the exploration and use of outer space for peaceful purposes. According to this agreement, both sides will work together on space sciences, exploration of outer space, use of space technology, monitoring of earth's environment from outer space and remote sensing, use of integrated Biak ground station of Indonesia for mutual benefit, hosting of Indian ground station in Indonesia, support for launch services of LAPAN (Indonesia's National Institute of Aeronautics and Space)-made satellites and joint research and development activities in space technology among others. The two sides also signed 12 memorandums of understanding (MoUs), including on scientific and technological cooperation, technical cooperation in the railways sector, health cooperation, and on promoting economic, trade and technological cooperation. Both sides signed a separate plan of activities to celebrate to 70 years of diplomatic relations in 2019-20.Modi arrived here on Tuesday on the first leg of his five-day three-nation tour of southeast Asia that will also see him visiting Malaysia and Singapore.This is his first visit to Indonesia as Prime Minister.